Public lighting in towns is taken for granted these days, but did you ever wonder who looks after the installation and maintenance on such lighting. 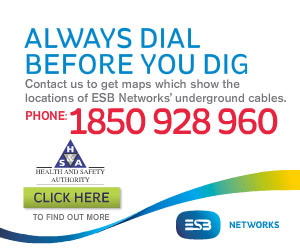 For this edition of the magazine, we take a look at a company that has been tasked with the job to ensure that the people in all Connacht, Longford and Westmeath can travel safely on footpaths and roads by looking after every street light in the province. 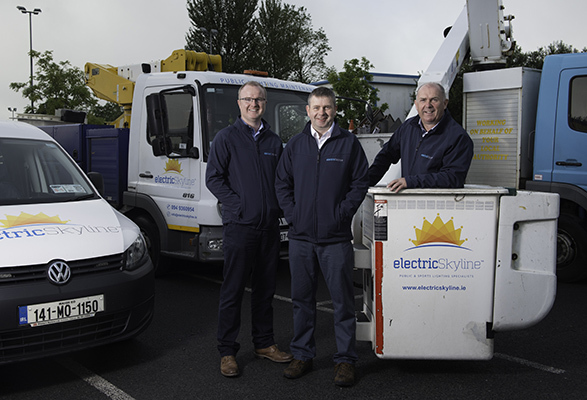 Electric Skyline Limited is a company based in Claremorris, Co Mayo and recently they have secured a €4 million contract by six local authorities in Connacht to look after every public street light. That amasses to 58,000 public street lights throughout the five counties, a daunting task many may feel, but with the expertise and guile that Electric Skyline possess, there is no better company equipped to carry out this contract to the highest standard possible. The five-year contract will see the company look after the maintenance of the street lighting, which sounds an almost impossible task, but managing director Sean Corcoran revealed how they operate. “We have two guys with designated regions driving around the towns and assessing the public street lights. If there is a fault or a light not working, they record that in the system and it is then assigned to maintenance crews who go out and fix the issue as soon as possible,” said Sean. “We are contracted to look after the management and maintenance of the street lighting, while there is also a massive emphasis on energy saving. We are currently looking at a number of different ways of implementing this. Electric Skyline are not new to this kind of work as they have held a contract for five of the local authorities in the past. Sean added that the five-year contract safeguards the future of the business for that period of time at the very least. “This will secure the jobs of 25 staff here in the west and we expect it to lead to the creation of an additional five jobs over the next five years. Electric Skyline are not solely reliant on this contract as they have a number of ongoing projects at present that cover a wide range of sectors including sports lighting, internal lighting, lighting design and school warning lights. Safety is number 1 with Electric Skyline and are very proud of the fact that we have had no lost time accidents since the formation of the company in 2007. “We invest a lot of resources in Health & Safety and have our own full time Health & Safety Officer ensuring all staff have everything in place to carry out the works safely” Sean added “in 2014 we were accredited with ISO 9001 ISOH 14001 and OHSAS 18001, very few in our industry have this level of accreditation. The company was formed in 2007 by Sean and his partners Brendan Reilly and Bryan Fox and over the last nine years, they have gone from strength to strength. Energy efficiency is a key part of the business as more and more emphasis is placed on protecting the environment and also keeping costs down. “Electric Skyline are aware that the world we live in is ever changing and that we have a responsibility to improve energy usage for our various lighting requirements. For business or Local Authorities lighting is the easiest way of reducing energy and the changing to LED improves the illumination of the particular areas.50% savings can be achieved by gathering the correct information and carrying out lighting design. We provide a lighting design service which includes site visit, technical appraisal and design. We will source the most efficient project to suit the customer needs taking account of budget available. Sports Lighting is a massive part of the business and they can call them specialists in this area having completed numerous projects for the likes of Kildare GAA Centre of Excellence, Leitrim GAA Centre of Excellence, Moate All Whites GAA Club, Annaghdown GAA Club, Carlow Institute of Technology, Knock Kiltimagh FC, Moycullen GAA, Moyne Villa FC, Eyrescourt All Weather Pitch, Aghamore Community Pitch and Running Track and Ballintubber GAA Training Pitch to name just a few. “When you choose Electric Skyline, you are choosing a brand you can trust at a price you can afford. An exceptional after sales service means that your queries will be answered by the team 24 hours a day seven days a week. Electric Skyline is an Irish company and support Irish suppliers where possible, so there's no delay getting projects completed on time and within budget,” added Sean. “The work has to be carried out to the highest standard. Since we started nine years ago, we have grown every year and we are always looking at ways of improving the business and the service provided.